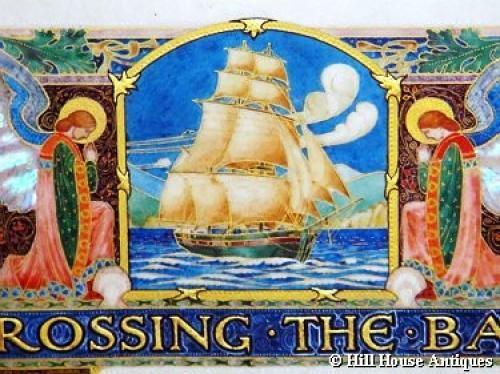 An exquisite and superb quality, late 19thC illumination, by Alan Tabor, (label verso) of Alfred Lord Tennyson's famous poem, "Crossing the Bar". Tennyson wrote this in 1889, three years before his death and although he followed this work with subsequent poems, he requested that "Crossing the Bar" appear as the final poem in all collections of his work. Charles Hubert Hastings Parry (1848-1918) was one of the best-loved English composers; famous for his setting of Blakes poem "Jerusalem". In 1894 he became Director of the Royal College of Music and was created a baronet in 1903. In the same year his setting of Alfred Lord Tennysons famous poem “Crossing the Bar” was composed and heard firstly at the Hereford Festival. It has since found its way into many hymn books and collections of inspirational songs.